Link It Up! 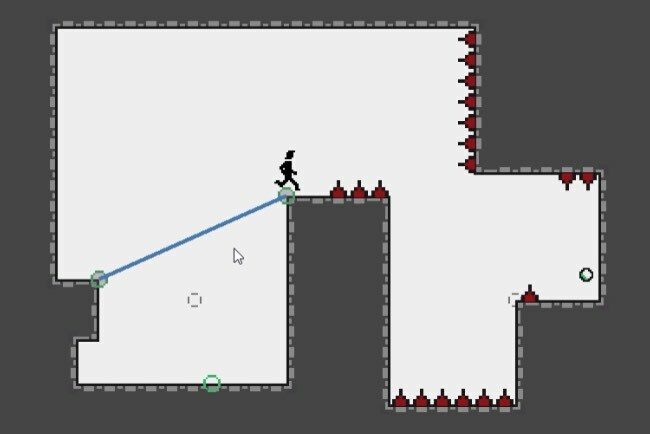 is a clever little puzzle platformer where you have one moveable line that you can use to help you make your way through each level. In Link It Up! you control a little stickman character with the WASD keys and you can move a line between various fixed anchor points with the mouse. The line has to be attached to two anchor points for it to be solid (so you can’t just hold one end with the mouse) and it can only attach to anchor points that are active (some anchor points need to be activated before you can use them). You can’t jump, but your character can use special blue lines as trampolines to help propel them high through the air. It takes around 30 minutes to play through Link It Up!’s 30 single-screen levels. The puzzle design is incredibly inventive throughout, with levels that can look impossible at first glance and have solutions that feel like you’re breaking the rules of the game (though you’re not). It’s amazing how much you can do with a little problem solving and a single moveable line! Highly recommended.